Best recipe for watermelon smoothie! Try a recipe for watermelon smoothies to mix things up this summer. Watermelons are a great all time favorite at BBQ’s and potlucks. There is just nothing like going all out with a watermelon seed spitting war in the backyard. A melon smoothie is very refreshing and is considered low in calories. To make them even lower in calories, check out these tips on how to make low calorie smoothie recipes in your own kitchen. 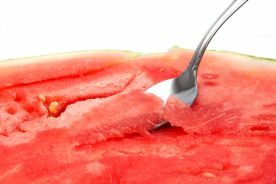 One thing to keep in mind... Melons usually are advised to not be eaten with other fruits or vegetables. They digest much faster than other foods. If eaten with other harder to digest foods, they might start to ferment more quickly in your digestive track and cause gas. But many people do not run across this problem. Just keep this in mind if you do have problems. Prepare your taste buds to to be amazed! First, pour juice into the blender. Second, place the mango and watermelon on the bottom with the frozen berries and ice on top. Blend on low for 10-20 seconds. Then increase the speed to medium/high until creamy smooth.